Boxty (or in Irish ‘Bacstaí’) is a recipe also known as ‘Arán bocht tí’ which in Irish means “poor house bread”, this is a traditional Irish potato cake fried on an Irish griddle, or as here, in a hanging bake pan over the fire, eaten in the northern Irish counties such as Cavan and Donegal, with Leitrim and the Drumlin areas seeming to be the home of boxty. Although Boxty is now eaten as a side dish to a main course it was once a staple in the diet of the rural and urban poor, and was popularly served and eaten on All Hallows’ Eve (Halloween) and on All Souls’ Day in Ireland. 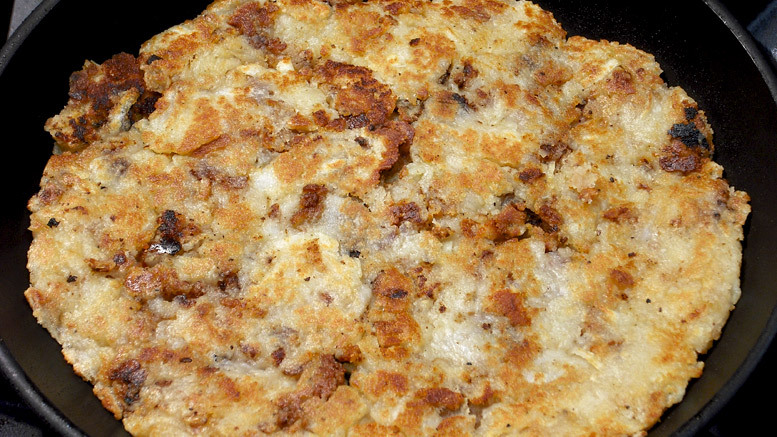 There are two types of ‘Boxty’, as referenced in the old Irish rhyme below – one is a dough, one is a batter – one makes a potato cake and one a potato bread (below). 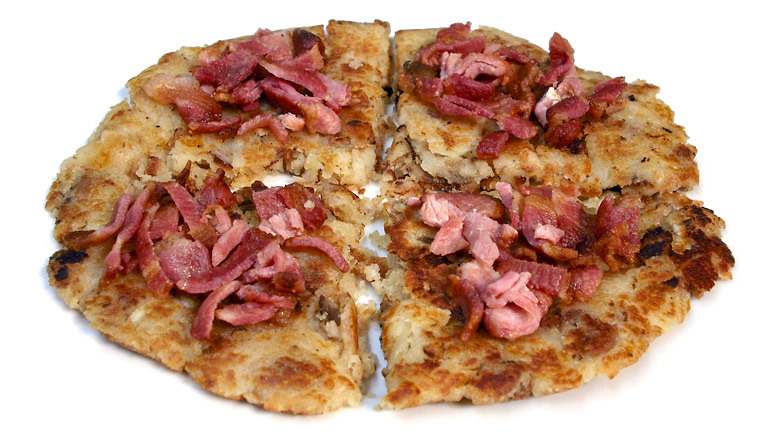 “Boxty on the griddle, Boxty in the pan, If you don’t eat Boxty you’ll never get a man” (trad. Irish rhyme). Boxty on the Griddle is cooked on a traditional Irish Bakestone and Boxty in a Pan is cooked in an old frying pan “Butter on the side, Gravy on the other, Sure them that gave me Boxty, Were better than my mother” (trad. Irish Rhyme). Serve Boxty with bacon, sausages, chops, roasts, liver and stews. Mr Patrick Gallagher, born in Cleendra, Co. Donegal, in 1873, and known as ‘Paddy the Cope’ (Cope being short for Co-op – as Paddy was the principle founder of the Templecrone Co-operative Society in 1906) recalled just before his death in 1966, at the age of ninety-two, that when he was a child Boxty was often served instead of oat bread, with milk and salt, and this was known as ‘Dippity’. A traditional and plainer boxty can quickly be made using this recipe Grated Potato Cakes In The Pan. Note: the first (late nineteenth century) recipe calls for more flour than the other recipes, however by adding in more flour it dominates the taste of the boxty, (presumably to make the ingredients stretch further in poorer households) the quantity suggested below makes the best balance between potato and flour – the flour should help bind the boxty, not take over. Peel the potatoes, take half (500g) and grate into a clean cloth – wring this cloth out tightly over a basin to catch the potato liquid as you squeeze them – reserve this liquid to use later in mixing the dough. Take the other half of the peeled potatoes (500g) chop them up small and boil them in a saucepan of water (which just covers the potatoes) until tender. Drain these boiled potatoes and then mash them. Allow to cool. As the boiled potatoes are cooking fry the 8 slices of bacon in a large frying pan in the lard, do not burn the bacon or the fat which is released. Reserve this bacon fat for later – allow to cool. Once fried remove the bacon, place onto a baking tray and bake in the oven, or under a grill until golden and crispy. Reserve this crispy bacon for later. Into a mixing bowl add the drained grated raw potatoes and mashed cooked potatoes. Add to this mixture the half the cooled bacon fat from the frying pan, the flour (sifted), the melted butter and the salt and pepper. Mix thoroughly and to loosen the mixture into a dough add back just enough of the reserved potato water you squeezed out of the raw potatoes through the cloth. 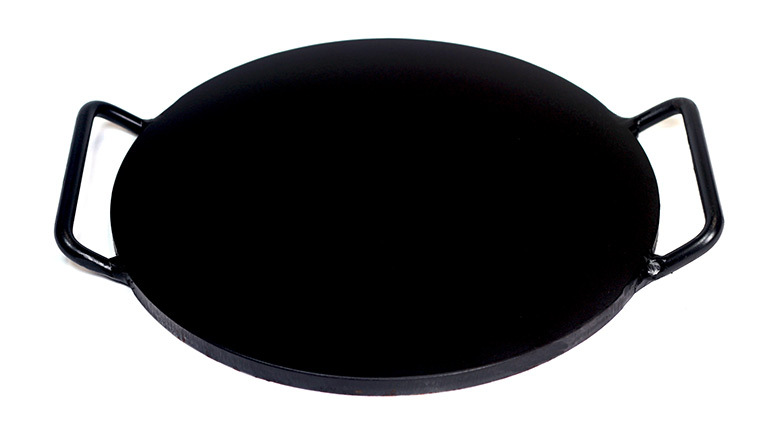 Once into a pliable dough knead gently and then roll out (about 8mm thick) onto a floured work surface. 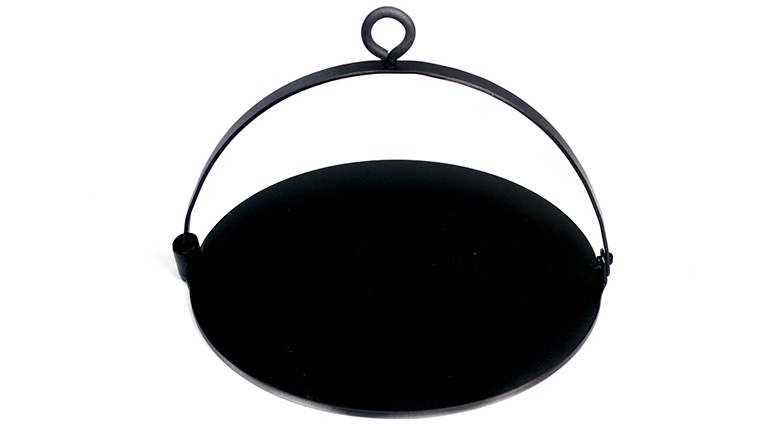 Using a large plate, the same size as will fit into the frying pan, cut out a round circle, and then with the knife mark out a large cross, do not cut all the way through. The cross will allow you to make a ‘farl’ once the Boxty is cooked. 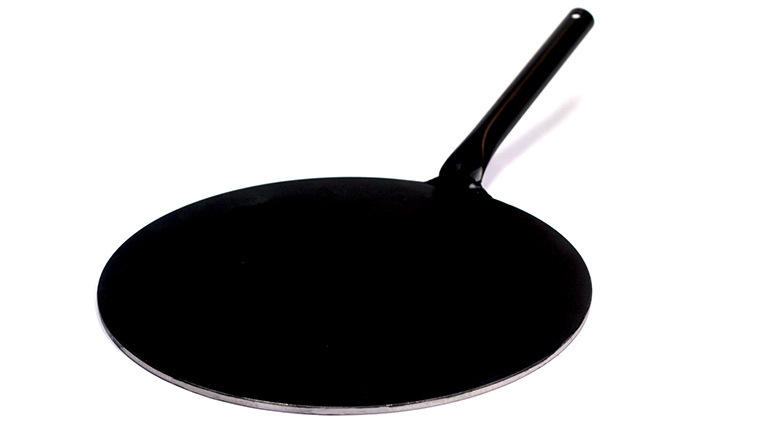 A farl is a triangle shape once a large circle shaped pancake, drop scone or Boxty has been cut into 4 pieces. Put the frying pan back onto a medium heat with the remaining bacon fat. 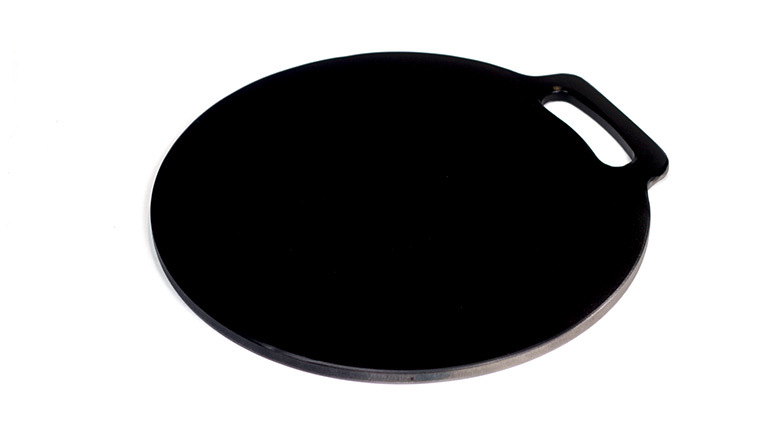 Carefully lift the large circle boxty into the hot frying pan and fry on both sides. Once fried and golden, cooked through, slice the Boxty into farls using the cross you made as a guide, and serve ‘Boxty in the pan’ on a plate with the crispy bacon – use up the remaining boxty dough as directed. Boxty in the Pan: 1lb. raw potatoes; 1lb. flour; 1lb cooked mashed potatoes; 4oz bacon fat (or butter); salt and pepper; – for Boxty on the Griddle: add 1tsp of bicarbonate of soda and enough milk to make a batter of dropping consistency. Peel and wash large potatoes, grate them into a basin, drain lightly, and to each cupful of grated potatoes add 1 level teaspoonful salt, 1/2 cupful flour and enough milk to make a fairly stiff batter. Leave to stand for 1 hour, then fry like pancakes in bacon dripping. Serve hot with butter. 1lb (450g) potatoes, peeled; 4 oz. (100g) self-raising flour; 4 fl oz. (125ml) milk; sea salt; freshly ground black pepper; 2 oz. (50g) bacon fat or butter.